San Francisco, Apr. 2010: The following essay by Maria Porges is reprinted with permission and is from the catalogue that accompanies the exhibition, Lorraine Peltz: New Works, on view from March 2 - May 1, 2010 at Micaela Gallery, 49 Geary St., San Francisco, CA. Maria Porges is an artist and writer who lives in Oakland, CA. She is an Adjunct Professor at the California College of the Arts. 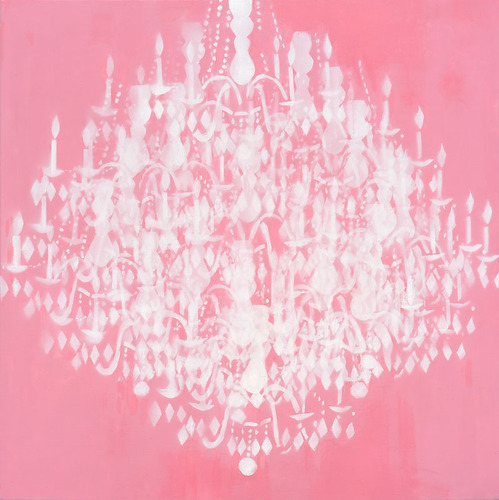 Like a perfect hair style, a chandelier can be the crowning touch for a beautiful and/or imposing room. 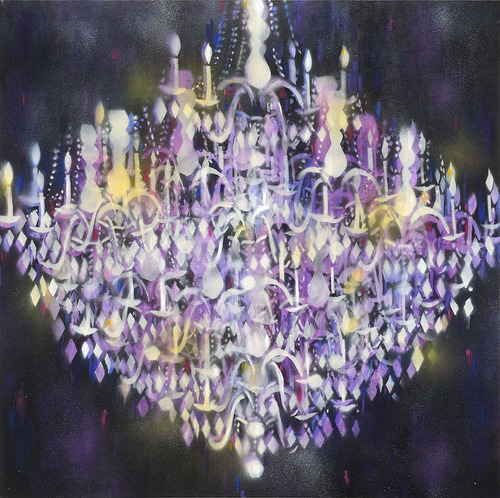 Having evolved (in a manner of speaking) from a few candles stuck on crossed boards to fantastic confections of blown glass and cut crystal, chandeliers are both sun and moon for many different kinds of interior worlds. The German word for this kind of light fixture suggests this idea perfectly: Kronleuchter. Crown of light. 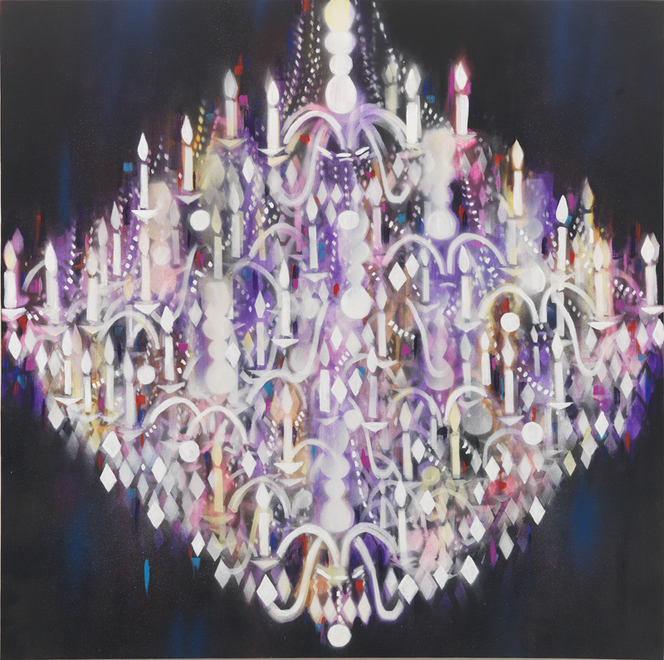 Lorraine Peltz’s shamelessly beautiful paintings of ghostly, graceful chandeliers feature some particularly baroque-looking versions of these glittering fixtures. In her pictures, they float in an unmediated, unidentifiable space, seen from a moderate distance (in the smallest paintings) or from so close that they all but fill the frame (in the largest). Peltz has been described as a painter of pleasure—a description that seems apt not only in terms of the visual enjoyment provided by her canvases, but in the way in which her current subject matter suggests the celebration of some significant event. To American eyes, these sparkling clusters of crystal bits signal opulence: exclusive events involving girls in low-cut, full-skirted dresses, walking down staircases into ballrooms where generals and presidents once signed treaties. There are chandeliers in soap operas and in opera houses, not to mention in every casino in Las Vegas. They are often found in wedding chapels, hotel lobbies, theaters and funeral parlors--locations of both happiness and sadness, in both of which there is pleasure, at different times. For Peltz, they invoke an additional, more personal narrative. 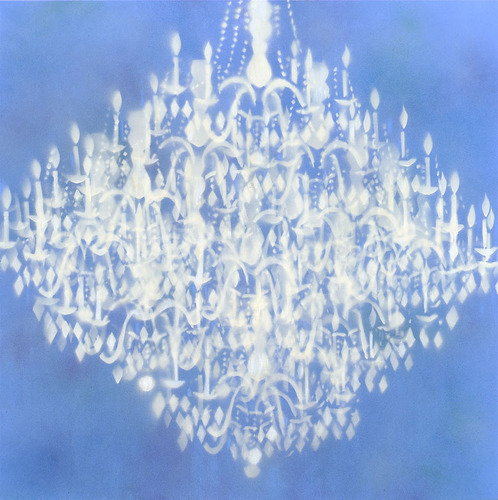 Throughout the Austro-Hungarian Empire, before the wars of the twentieth century rearranged many Middle European borders and lives, a chandelier was found in many, many homes: something pretty and ornate, made of the clear, colorless and brilliantly refractive glass that comes from Bohemia (now part of the Czech Republic). Peltz’s mother, who grew up in Hungary, lost almost everything and everyone during the chaos of WW2. Later, however, when she married and made her own home in New York, she installed a chandelier like the one she remembered from her childhood in Hungary. This fixture, in turn, became a part of her daughter’s interior landscape. The subjects of Peltz’s work have always been drawn from her own life and experiences. In a sense, they are the props for the multiple roles she plays daily: artist, teacher, wife, mother, daughter. In the past, the objects she pictured were always hers: her shoes, her battered iron, her upright vacuum cleaner— but they were also metaphors. How could they not be? In the late ‘80s and early ‘90s—the period during which she began her career—a number of women artists were looking for a way to make work that could address the broad social inequities facing their gender without being didactic or documentary. With the succinctness and wit of a graphic novel, Peltz’s work has always offered the viewer an opportunity to enter her narrative. Still, there is something different about these most recent paintings. 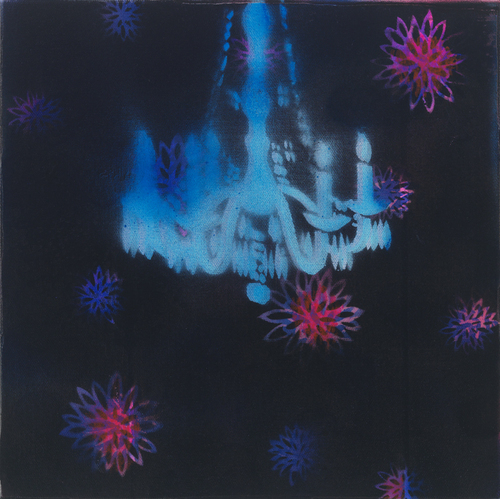 The chandelier may serve as a highly personal, profoundly Proustian madeleine for Peltz. But it also offers a wealth of possible readings--private and public, social and historical, unique and stereotypical—to her viewers. There is an innate generosity about the way these paintings leave room for all of us to enter; to experience our own desires and dreams. But what about the invitation made by the way Peltz paints her current subject? By this, I mean not just her unrestrained enjoyment of seductive color, but the shifting, tantalizing way in which images slip in and out of focus, like a celebrity viewed through a paparazzi’s telephoto lens. Should you change your point of view, you wonder, or squinch up your eyes to make the image more clear? But even getting up close and intimate doesn’t do what you might have expected. What you see from inches away is the paint: sheer, delicate layers of color, one over another over another. What does become clear is that this is the idea of a chandelier: the metaphor, the abstraction, the memory of one, seen from a kind of distance measured in years, not feet. To build up these layers, Peltz uses stencils cut from drawings based on a variety of found photographic images. Using a combination of brushwork and spraying, she miraculously manages to convey the transparency of glass or crystal without depicting it. The accumulation of these blurring forms seems organic, like the brushes and leaves that fill the interior of a shrub. This lack of easily recognizable structure reinforces the impression that these are not static objects. As memories do, Peltz’s constellations of color and light seem to move slightly but constantly, like the blurred figures in Gerhard Richter’s painting cycle featuring the protagonists in the Baader-Meinhof saga. As with Richter, there is an insistence that only painting can perform the tasks in which these images are engaged, in an era in which photography is supposed to have made more old-fashioned forms of image-rendering obsolete. Painting represents a lifetime of physical experience, traveling through the arm and hand—a haptic kind of knowledge. The act of mark making—whether with brush or spray paint—functions as a representation of time passing, and continuing to pass. Peltz’s pictures remind us that nothing, really, is still. The very ground on which we stand is a seething mass of tiny, jostling particles, as we are ourselves. Gazing at these paintings, we realize that we should stop and smell the flowers, even, dance to the music that is playing, somewhere nearby, underneath a gleaming chandelier. Speaking of hair, women’s up-dos in the 17th century became so monumental that the chandeliers at the French court had to be raised, to avert the increasingly-frequent incidents of candles singing bouffants up to three feet tall. The First Epistle to the Corinthians is dedicated principally to the subject of the importance of love for one another.